For students who wish to enter Japanese universities, graduate schools, or professional schools. Students are able to choose from beginner’s, intermediate, or advanced courses to meet their language abilities. Appropriate guidance will be provided for students wishing to go on to higher educational institutions. Guidance will be flexibly provided to meet various situations. These include not only those coming to Japan to study but also foreign families and relatives living in Japan wanting to receive higher education in Japan. ≫Complete support system for students living in dormitories, working part-time, etc. Foreign students to Japan are basically required to obtain a student visa. 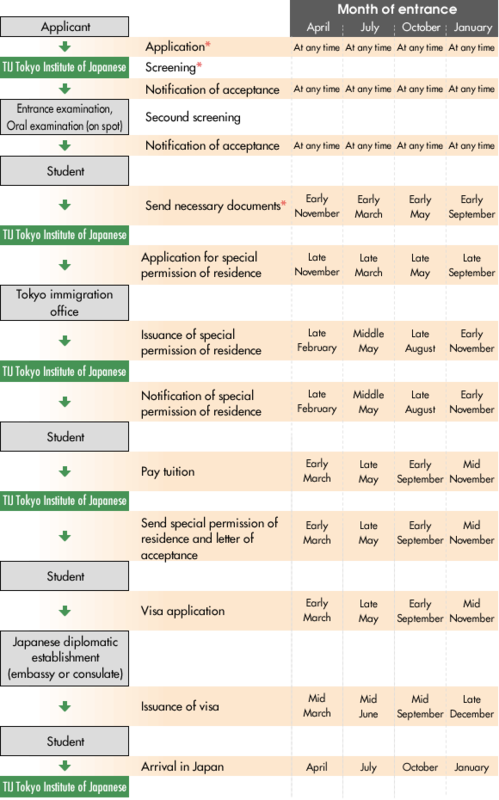 Application for authorization of residence eligibility to the Immigration Bureau will be done by TIJ Tokyo Institute of Japanese after screening of application documents, interviews, and achievement tests have been conducted and TIJ has confirmed the applicant’s purpose of studying in Japan, basic academic ability, and the ability to pay expenses. As a result, TIJ maintains a high rate of issuance of residential status. Ability to accurately understand academic content, and develop skills to state your opinion and write them down in essay form in preparation for studying at universities. *Download first screening documents and other documents here. * The required documents are different depending upon the applicant’s country. Please contact us in order to confirm which documents are required in your country. ≫ you can download from here. ※Please attach Japanese translation for the documents written in red. Please check Tuition fees list. All foreign residents living in Japan more than three months are required by law to enroll in the National Health Insurance system.The monthly premium for the National Health Insurance is about 1,000 yen. With this insurance, the amount that a patient must pay for consultation, treatment, operation, and hospital charges is 30% of the actual fee. All students at TIJ must enroll in the disaster compensation system. The system covers costs including injuries caused by various accidents in daily life, illnesses, and rescue expenses. For treatment costs, 30% of the fee of the National Health Insurance will be defrayed. The insurance premium is 15,800 yen for 1-year&6month, or 20,000 yen for 2 years. The school will apply for insurance in one batch so please send the premium together with the entrance fee. Information on the student’s choice of school, guidance on writing essays and taking interviews will be provided based on their preference and grade. November Exam for Japanese University Admission. Submit application, and take exam for private university. Guidance on writing essays and practicing interviews. 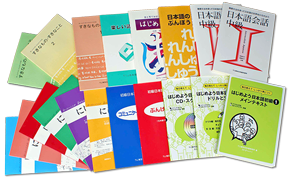 December Japanese Language Proficiency Test Submit application, and take exam for private university. Guidance on writing essays and practicing interviews. Tokyo University・Hitotsubashi University・Tokyo University of Technology・Tokyo University of the Arts・Tohoku University・Nagoya University・Tsukuba University・Chiba University・Saitama University・Yokohama National University・Tokyo Metropolitan University, etc. Keio University・Waseda University・Chuo University・Rikkyo University・Hosei University・Nihon University・Toyo University, etc. Chiba University・Yokohama National University・Ochanomizu University・Tokyo University of Foreign Studies・Tokyo Gakugei University・The University of Electro-Communications・Saitama University・Yokohama City University ・Shizuoka University ・Shinshu University ・Fukushima University, etc. Waseda University・Sophia University・Meiji University・Rikkyo University・Aoyama Gakuin University・Ritsumeikan University ・Tokyo Women’s Christian University・Nihon University・Toyo University・Komazawa University・Dokkyo University・Kanagawa University・Takushoku University・Bunri Universty of Hospitality・Kyoritsu Women’s Universty・Chiba Institute of Technology・Chiba Universty of Commerce etc. Toyota Technical College Tokyo・Yomiuri College of Car Mechanic・Nihon Kenko Iryo Senmon Gakko・International School of Business・Tokyo IT Kaikei Senmongakko・Nihon Kogakuin College・Ecoles de patisserie et de Cuisine KOKUSAI・Yamano Beauty College, etc. Copyright © TIJ東京日本語研修所. All Rights Reserved.